Before we go any further with the recipes I think it is important to make sure everyone knows how to fillet a fish. 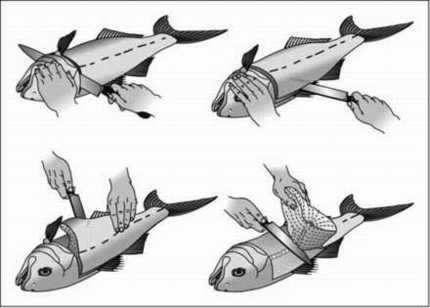 So here is a basic step by step to fillet your catch. It takes a certain amount of touch to fillet a fish, but expending a little more effort at the cleaning stage is worth it because it means no bones at the eating stage. When you get the hang of filleting, you can zip through a pile of fish pretty quickly, and it gives you a sense of accomplishment. Remember, always make sure to use a sharp knife, it makes a world of difference. Don't worry too much if you don't get absolutely all the meat off the fish when you first start filleting. The idea at the beginning is to get some. If you skin the fish, as recommended, you do not have to scale it first. Obviously, if you are going to use the skin, scale it unless you like to eat scales. Figure 1 shows the basics of filleting a small fish (up to about 5 pounds). Figure 1: Filleting a small fish. 1. Cut off the head just behind the gills. 2. Hold the fish by the tail. With the knife blade pointing away from you and across the body of the fish, begin to cut toward the head (or at least where the head used to be). Use the backbone to guide your knife. 3. To take the skin off, begin by holding the fillet by the tail, skin side down. 4. Hold the knife crosswise across the fillet and insert the knife between the skin and the flesh. Don't worry if you don't get this perfect at first. 5. While holding the skin, cut in the direction of where the head used to be. When you have a larger fish, the tail-to-head method of filleting can be a little awkward. 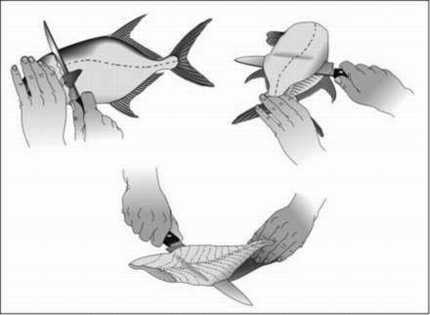 In this case opening the fish like a book is an effective method, as shown in Figure 2. Figure 2: Try this technique for filleting larger fish. 1. Make a deep cut just behind the gills (about halfway through the thickness of the fish). 2. Cut a slit a few inches in length along the top of the fish (the dorsal side). 3. Using the tip of the knife, separate the flesh from the bones, as illustrated. The fish should open up just like a book. 4. When completely open, finish cutting away the fillet by moving the knife along the "spine of the book." This is a great step by step guide for beginners. A must know for the worlds easiest Pike recipe that is coming soon and for the trout recipes I have posted already. Another simple and easy Trout Recipe. Oven Roasted Trout with Lemon Dill Stuffing.. need I say more? That's about as simple as it gets folks. Enjoy!! Stay tuned next month for a easy Pike recipe!! Sometimes with all the commotion and excitement of getting your line wet and catching the big one, or just trying to out fish your friends we forget about the beauty that surrounds us. The feeling when you first arrive at the lake, you see the sun come up, the morning dew, the fresh smell. It's those reasons I am still fishing today. When I first started fishing all those years ago, trying to figure out what lure for what fish, before I knew the importance of different depths and temperature I would leave the lake empty handed and discouraged. But I never really labelled it as a 'failed' outing. Fish or no fish I like being outdoors and fishing ponds and lakes offer some of the most picturesque scenery, especially if you get the chance to fish in the rocky mountains in Banff and Jasper, Alberta. Lake Maligne (pictured above) in Jasper is a great example. It is full of Rainbow and Brook trout and is 318ft at its deepest and is very unlikely you would leave without landing a few nice trout, but if you did happen to have one of those epic bad days the backdrop of this gem still makes it feel worth it. So the next time you get skunked take a deep breath of that fresh air and look around, things really aren't that bad. I am a guy who just fishes for the fun of the sport. I enjoy the quiet of the outdoors, the sound of the water rolling up on the shore, the sway of the boat in the waves. All this enjoyment comes to a hauling end when you're reeling in a fish with a good fight and SNAP!!! there goes your line and your favourite fishing lure. (If only you took the time to make a couple more loops in your knot). Hey, I've been there. When I first started fishing I was so excited to get my line in the water I would tie my knot as fast as I could and lose my first fish every time, and we all know the one you lost was the biggest one of the day. Here is a link for an improved clinch knot. It is easy and secure. It is always good to have everything ready the night before you go so there is less time wasted in the morning. I always found if I waited till the morning to get my tackle box or snacks ready I would forget something. Every time! There is nothing worse that being out on the lake and realizing you forgot your sandwiches, sun screen, sun glasses or your tackle box. But that is a story for another day..
For all those who love trout fishing, here is a quick, simple and delicious recipe for baked trout. - Place trout in the baking dish and coat with remaining olive oil. Season the inside and outside of the fish with dill, thyme and salt. Stuff each fish with onion slices. Grind pepper on top and place 1 lemon slice on each fish. Adding water to the dish after the first 10min of baking is very important, it will prevent the fish from drying out. Simple, easy and delicious. Stay tuned for another fish recipe next month.